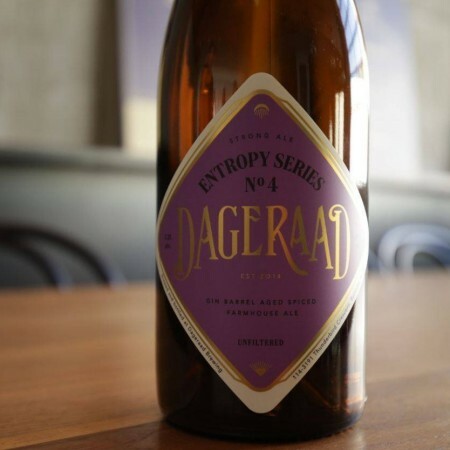 BURNABY, BC – Dageraad Brewing has announced the release of the fourth in its Entropy Series of limited edition barrel-aged beers. Our good friends at Deep Cove Brewers and Distillers let us have a barrel in which they aged some excellent gin, and we filled that barrel with our Lake City Farmhouse ale. Lake City Farmhouse is brewed with small amounts of rosemary and sage, among other spices, and it blended beautifully with the botanicals used in Deep Cove’s gin. The mix of flavours is so harmonious, it’s difficult to tell where the beer ends and the gin begins. Entropy Series No. 4 is limited to 21 cases of 750 ml bottles, and will go on sale tomorrow (Wednesday October 4th) at 12:00 noon exclusively at the Dageraad taproom and retail store for $12 per bottle, with a limit of 2 per customer while supplies last.